The hurricanes slicing through southern states should prompt consumers elsewhere to check their homeowners insurance policies to make sure they've got enough coverage. "This isn't something you do when there's a storm bearing down on you," said Loretta Worters, a vice president with the Insurance Information Institute, an industry group based in New York. "It's something you should try to do at least once a year." Consumers who aren't informed about what their policies cover — or who haven't updated them in recent years to account for improvements to their homes — could find themselves short of the cash if they need to make extensive repairs or to rebuild after a storm, she said. Premiums have risen sharply in many states, especially along the coasts, because of the threat of earthquakes and hurricanes. And that's true whether a homeowner has a "cash value" policy, which reimburses the consumer for the depreciated value of a home and its furnishings, or a "replacement cost" policy, which pays for the repair or replacement of damaged property with materials of similar kind and quality. A surprise to some of this year's hurricane victims is that many insurance companies have changed the deductibles in storm-threatened areas. A deductible is the money a homeowner has to pay out of pocket before insurance coverage kicks in. "Seventeen states now use 'catastrophe deductibles' for hurricanes and windstorms," Worters said. It's usually a percentage of the value of the home — generally 1 percent to 5 percent — rather than the fixed $500 or $1,000 deductible on most policies, she said. "A coastal resident with a home insured for $200,000, for example, could be responsible for at least $2,000 and perhaps as much as $10,000 worth of storm damage before insurance kicks in," she said. Robert Klein, director of the Center for Risk Management and Insurance Research at Georgia State University's Robinson College of Business, said the higher deductibles were necessary to keep insurance companies writing policies in threatened areas. "If you have a lot of homes with a small amount of damage to each one, that can really mount up for the insurer," Klein said. "The (higher) deductibles help insurers manager their risk better." At the same time, he said, "people need to be aware of them and make sure they have adequate resources to cover those deductibles." Another surprise to homeowners in coastal states hit by the hurricanes is that standard homeowners insurance doesn't cover flooding. Flood insurance can be purchased through the Federal Emergency Management Agency's National Flood Insurance Program, which maintains a Web site at www.nfip.gov. Although flooding causes an estimated $2 billion in property damage a year, only about one-quarter of the homes in flood plains purchase flood insurance, the Insurance Information Institute said. 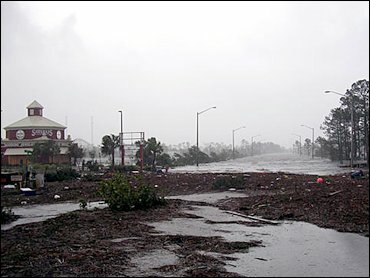 In some vulnerable areas, insurers have been reluctant to continue covering catastrophic natural disasters because it could bankrupt them. That was the situation in California after the Northridge earthquake in 1994 cost the companies some $12.5 billion to cover homeowners' damage. So the state created the California Earthquake Authority, which acts through participating private insurers to underwrite homeowners insurance in earthquake-prone areas. A similar agency, Florida's Citizens Property Insurance Corp., underwrites policies covering wind damage. Connie Bracher, who heads the disaster committee of the California Society of Enrolled Agents, has worked with a number of homeowners after they've gone through earthquakes or forest fires. Enrolled agents are licensed by the government to assist consumers with their taxes. She said it's very important for families in disaster-prone areas to keep copies of important documents in a safe place, such as in a bank safety deposit box or with a relative who lives in a safer place. Important documents include copies of recent tax returns, mortgage and escrow papers, photos or videos of the home and its contents, birth certificates and other important personal papers, emergency phone numbers and insurance policies. "Having these things can really speed up the (insurance) claims process," Bracher said. A last resort for homeowners is a tax break for unreimbursed losses, but it's a hard deduction to get, she said. The formula for determining the deduction — outlined in the IRS Disaster Losses Kit, also known as Publication 2194 — is the total unreimbursed loss minus $100 minus 10 percent of adjusted gross income. "That just doesn't help many people," Bracher said.